Attorney. Conflict resolution. Legislative advocacy at the state level. Represented vulnerable populations in such areas as, criminal law, discrimination of individuals with disabilities, and child welfare. Leads Brandeis Summer in The Hague. 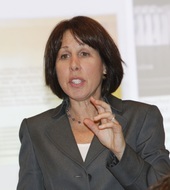 Melissa Stimell is a Professor of the Practice in the Legal Studies Program at Brandeis University. She is the director of the internship programs for the Legal Studies Program and chair of the Program in Social Justice and Social Policy. She currently teaches Advocacy for Policy Change, Conflict Analysis and Intervention, Brandeis Summer in The Hague, and the seminars accompanying the internship programs. She received her undergraduate degree from Cornell University and her law degree from Boston University School of Law. She has been a public interest attorney for over 30 years, focusing on the representation of vulnerable populations in such areas as, criminal law, discrimination of individuals with disabilities, and child welfare.